If you’re working in HD, you need fast and reliable storage. If you’re doing a lot of work in HD, you also need easy expandability and improved file protection. Available in configurations of 16TB, 24TB, 32, or 48TB, Sonnet’s Fusion DX800RAID storage systems deliver breakthrough performance and proven data safety to meet those needs with affordable, direct attached disk arrays. Fusion DX800RAID storage systems are designed for work environments where high performance and fault tolerance are critical, and simple expandability a must. They are fast enough to easily handle uncompressed HD while protecting the data at the same time, yet flexible enough to be configured for any workflow. Under real world use (drives 85% filled and fragmented) with its drives formatted as a RAID 5 group (eight drives striped with parity across all group members), a Fusion DX800RAID storage system is capable of single-stream 2K (2048 x 1556) LOG RGB capture and playback. It can achieve up to 1300 MB/sec read, 1385 MB/sec write (AJA Kona 1080HD test), fast enough to handle a single stream of uncompressed 10-bit 1080 4:4:4 HD, or multiple streams of ProRes 422, uncompressed 8-bit 1080 HD, DV, HDV, and DVCPRO video. Raw data transfer rates are just one measure of a storage system’s abilities, but they don’t tell the whole story. How many video streams can be transferred at the same time without dropping frames is another measure critical in determining overall performance, and one that can greatly impact your workflow. Fusion DX800RAID storage systems achieve high stream counts because of their ability to consistently and efficiently sustain data throughput, a result of incorporating ATTO Technologies’ exclusive Advanced Data Streaming (ADS™) Technology in the included Sonnet PCI Express® (PCIe) RAID controller card. ADS provides controlled acceleration of data transfers, compensating for transfer speed peaks and drops to maintain a consistent data flow, allowing more streams without dropped frames for the bandwidth available. With drives formatted as a RAID 4, 5, 6, or DVRAID™ protected group, Fusion DX800RAID storage systems provide data protection in the event of a drive failure (two drives when formatted as a RAID 6 group). You can configure your system to provide visual and audible alerts, including e-mail notification in the event of a drive failure. A drive can be swapped out and the RAID group rebuilt in hours, or you can tune the rebuild priority to deliver full read performance during the process to keep you working while the RAID group rebuilds in the background. Fusion DX800RAID storage systems provide additional protection beyond basic data security. The Sonnet 6 Gb/s SAS/SATA RAID controller employs ATTO Technologies’ exclusive DriveAssure™ Technology, which monitors drives’ I/O performance and performs periodic drive scans to map out and repair bad sectors and slow spots without failing the drive. This proactive maintenance enables the controller to compensate for instances when a RAID group does not respond to a command within a specified time, which could lead to degraded performance (e.g., dropped frames), or worse, the RAID group being failed. What happens if a drive does fail? In most instances, a protected RAID group rebuilds using data on the remaining drives. Protected RAID groups using high capacity drives face a greater risk of a second or third drive failure during a RAID group rebuild. When this occurs, most storage systems fail the RAID group and take it offline, making the data inaccessible. 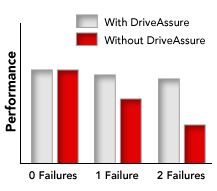 DriveAssure can recover data when other methods have failed. Its data recovery modes enable access to data in offline RAID groups so you can copy it to a new RAID group or continue working with it in the case of a soft drive failure. This ability can potentially mean the difference between the loss of a single file versus all of your assets. 8TB, 16TB, 24TB, 32TB, or 48TB to start—it's your choice. When you need to grow your storage capacity, wouldn't you like a system that's expandable without hassle? Sonnet's got you covered. When your job calls for access to more than 48TB of files at a time, Sonnet offers an economical upgrade path that is simple to deploy—Fusion DX800RAID Expansion storage systems. Each DX800RAID storage system features an internal SAS (Serial Attached SCSI) expander that enables you to connect additional DX800RAID enclosures in a daisy chain, no additional RAID controller card needed. This simplifies installation and significantly reduces your cost to expand capacity. Of course, if your needs are simpler, each system includes user-swappable drive modules so you can easily change sets of drives as you go. Easy, Economical Expandability—Fusion DX800RAID's internal SAS expander enables you to connect up to 16 Fusion DX800RAID Expansion enclosures to a single Sonnet RAID controller card in a daisy chain, simplifying installation and significantly reducing the cost for expandable storage. Fusion DX800RAID storage systems integrate an ultra-quiet Vantec Stealth™ fan. This fan is 80% quieter than a standard case fan, making this system well suited for use in noise-sensitive environments. Fusion DX800RAID enclosures link to the Sonnet RAID controller with robust mini-SAS to mini-SAS connector cables that lock securely at both ends. Fusion DX800RAID systems support RAID 4 (DVRAID), 5, 6, and 10 for balanced performance and protection, RAID 1 for ultimate redundancy, and RAID 0 for pure, unadulterated speed; JBOD support is available, too. Fusion DX800RAID systems even support hot spares—you can set up your RAID group so that one or more designated hot spare drives wait unused in the background to automatically replace a failed drive without you having to lift a finger. All this flexibility is accomplished without switches—a simple to use configuration utility enables you to optimize your setup for specific workflow requirements. 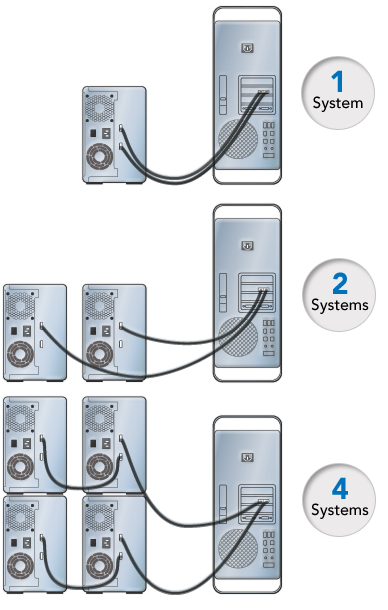 The reliability of the Fusion DX800RAID is further enhanced through SES (SCSI Enclosure Services) 2.0 compliance, a feature more commonly found on enterprise storage systems, and enhanced S.M.A.R.T (Self-Monitoring Analysis and Reporting Technology) data reporting for each hard drive installed in the system. Built into the Fusion DX800RAID enclosure, SES functionality provides enhanced real-time monitoring and reporting of drive, power supply, and temperature status, with real time results displayed in utility application screens and the illumination of conveniently placed LEDs on the enclosure. S.M.A.R.T. 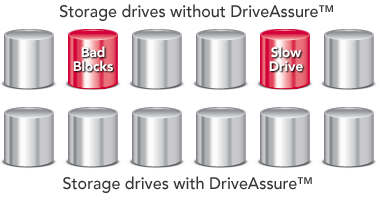 data criteria can be used to notify you of an impending drive failure and enable you to minimize downtime as a result. The heart of a Fusion DX800RAID storage system is the Sonnet 6Gb/s SAS/SATA RAID controller. Offering eight lanes of PCIe 2.0 connectivity, this powerhouse adapter is based on the latest-generation Marvell® 88RC9580 RAID-on-Chip (ROC) processor, which handles the throughput from all the drives with plenty of overhead. The Sonnet 6Gb/s SAS/SATA RAID controller is configured with 512MB of ECC-protected cache memory, especially important to maintain data stream writes as the disk array nears capacity. Fusion storage systems employ Enterprise/RAID Edition hard drives or select, Sonnet certified drives that have been selected for their superior performance, error handling, and reliability characteristics, especially when used in RAID groups. These drives are subjected to hours of additional, stringent testing to check for soft errors, vibration, and other reliability predictors. Just the sturdiest drives pass these tests and are prepared with special RAID-optimized firmware to become the building blocks of a super-reliable Fusion storage system. Today's ultra-light notebooks, mini, and all-in-one desktop computers now have tremendous processing power, but they lack the ability to connect an equally powerful pro video editing storage solution (much less the capability to install a high performance RAID controller card). Sonnet offers a solution that addresses both shortcomings—the Fusion DX800RAID Thunderbolt 2 Edition. This package marries a Fusion DX800RAID system, the Sonnet 6Gb/s SAS/SATA RAID Controller, and Sonnet's Echo Express SEL Thunderbolt 2 Expansion Chassis for PCIe cards to deliver HD optimized performance and proven data safety to users of iMac®, Mac® mini, MacBook® Air and MacBook Pro computers with Thunderbolt ports. These systems are ideal for use in mixed environments—various operating systems, editing applications and output demands requiring the flexibility and interoperability that Fusion DX800RAID storage systems provide. Fusion DX800RAID systems support OS X®, Windows® 8, Windows 7, Windows Vista®, Windows XP, Windows Server 2008, Windows Server 2003, and Linux. They are compatible with capture cards from AJA, Blackmagic Design, Matrox, and Bluefish444, and work with all mainstream video editing applications including Apple® Final Cut Pro® X, and Adobe® Premiere® Pro. Find drive modules for earlier Fusion DX800RAID systems (part numbers beginning with FUS-DX8M) here. The Sonnet Fusion DX800 is best suited to a workstation in which there will be intensive editing of complex material, of HD or 2K footage, where speed will enhance even compressed formats, and where the security of redundancy is essential. Sonnet is another of those companies that is both technology as well as customer driven. They understand video and the single vendor solution ensures quick replacement or repair of the unit. All RAIDS are not created equal and the Fusion DX800 stands out in its field for quiet operation, solid enclosure, fast PCIe card and excellent support."